This paper was presented at the FIG Commission 3 meeting in Naples, Italy and was chosen by commission 3 as paper of the month. This paper examines the drivers of the “Big Data” phenomena and look to identify how authoritative and big data may co-exist. The volume of data and its availability through the internet is impacting us all. The traditional geospatial industries and users have been early adopters of technology, initially through the early development of geographic information systems and more recently via information and communication technology (ICT) advances in data sharing and the internet. Mobile technology and the rapid adoption of social media applications has further accelerated the accessibility, sharing and distribution of all forms of data including geospatial data. The popularity of crowd-sourced data (CSD) now provides users with a high degree of information currency and availability but this must also be balanced with a level of quality such as spatial accuracy, reliability, credibility and relevance. National and sub-national mapping agencies have traditionally been the custodians of authoritative geospatial data, but the lack of currency of some authoritative data sets has been questioned. To this end, mapping agencies are transitioning from inwardly focussed and closed agencies to outwardly looking and accessible infrastructures of spatial data. The Internet of Things (IoT) and the ability to inter-connect and link data provides the opportunity to leverage the vast data, information and knowledge sources across the globe. This paper will examine the drivers of the “Big Data” phenomena and look to identify how authoritative and big data may co-exist. There is no doubt that advances in technology is impacting significantly across society. In particular, the connectivity provided through advances in information and communication technology (ICT) have enabled citizens, businesses and governments to connect and exchange data with increasing regularity and volume. 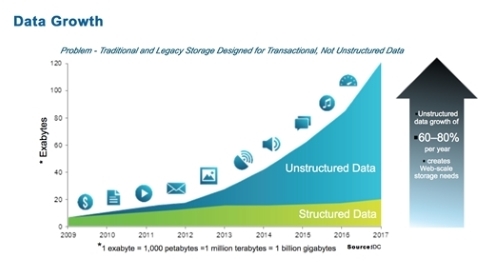 With the exponential growth of data sensors and their connectivity through the internet, the volume, frequency and variety of data has changed dramatically in the past decade. The connectivity of devices such as home appliances, vehicles, surveillance cameras and environmental sensors is often termed the Internet of things (IoT). In addition, the capability of cloud computing platforms to store, organise and distribute this data has created massive inter-connected repositories of data that is commonly termed “Big Data”. In many instances, the digital exchange of data has replaced direct human interaction through the automation of processes and the use of artificial intelligence. The geospatial industries and users have been early adopters of this technology, initially through the early development of geographic information systems (GIS) and more recently via ICT advances in data sharing and the internet. Mobile technology and the rapid adoption of social media and applications have further accelerated the accessibility, sharing and distribution of all forms of data, particularly geospatial data. Crowd-sourced data (CSD) now enables users to collect and distribute information that has a high degree of information currency. However, the availability of CSD must also be balanced with an understanding of data quality including spatial accuracy, reliability, credibility and relevance. The rate of change of technology has been extremely rapid when considered in the context of the operations of traditional geospatial mapping agencies. This paper will examine the developments of the “Big Data” phenomena in the context of the trends, opportunities and challenges in respect to the traditional geospatial custodian and authoritative data environments. The transition of mapping agencies from inwardly focussed organisations to increasing outwardly looking and accessible data infrastructures has been achieved in a relatively short period of time. This has been accomplished through not only the developments in ICT and positioning technology, but through changes in government policies and the realisation that existing systems were not servicing the key stakeholders – the citizens. This paper will firstly cover the progress of the digital geospatial data repositories and their transition towards spatial data infrastructures (SDIs). The development of more open data frameworks and policies, and the rapid increase in the quantity and variability of data, have created a number of challenges and opportunities for mapping agencies. The ability to inter-connect and link data has provided the opportunity to leverage the vast data, information and knowledge sources across the globe. However, the geospatial data collection and management approaches of the past may not be optimal in the current big data environment. Data veracity, volume, accessibility and the rate of change means that new approaches are required to understand, analyse, consume and visualise geospatial data solutions. Data mining, data analytics and artificial intelligence are now common practice within our search engines, but how can these approaches be utilised to improve the value and reliability of our authoritative data sources? The term ‘authoritative geospatial data’ is used to describe a data set that is officially recognized data that can be certified and is provided by an authoritative source. An authoritative source is an entity (usually a government agency) that is given authority to manage or develop data for a particular business purpose. Trusted data, or a trusted source, is often a term associated with authoritative data, however, it can also refer to a subsidiary source or subset of an authoritative data set. The data may be considered to be trusted if there is an official process for compiling the data to produce the data subset or a new data set. In addition to the foundational geospatial data detailed above, other geospatial data sets may also be considered to be authoritative by particular government agencies. When exploring the evolution of SDIs, it can be seen that the majority of SDIs have been led by national mapping agencies of various countries (McDougall 2006) and have considered users as passive recipients of this data (Budhathoki & Nedovic-Budic 2008). However, users are now active users of vast quantities of data and can also potentially contribute towards the development of SDI. In addressing this issue Budhathoki and Nedovic-Budic (2008) suggest we should reconceptualise the role of the ‘user’ of spatial data infrastructures to be a ‘producer’ and to include crowd-sourced spatial data in the SDI-related processes. Traditionally, SDIs have a top down structure in which organisations govern all the processes and the user generally receives the final product. This is a mismatch with the new concepts of the interactive web and the notion of crowd-sourced data. Hence, Bishr and Kuhn (2007) suggest to invert the process from top-down to bottom-up which clears the path for the next generation SDIs. 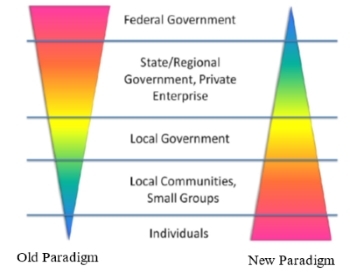 In the 1990s, the accepted spatial data model was in pyramid style (Figure 1) which was based on government data sources, but in more recent years, this pyramid is increasingly inverted (Bishr & Kuhn 2007). Related Application Programming Interfaces (APIs) can make SDIs more user-friendly and therefore ‘it is likely that SDIs and data stores will need to be retro-fashioned into API interrogation systems to ease the integration of past and future data sets’ (Harris & Lafone 2012). Bakri and Fairbairn (2011) developed a semantic similarity testing model for connecting user generated content and formal data sources as connecting disparate data models requires the generation of a common domain language. 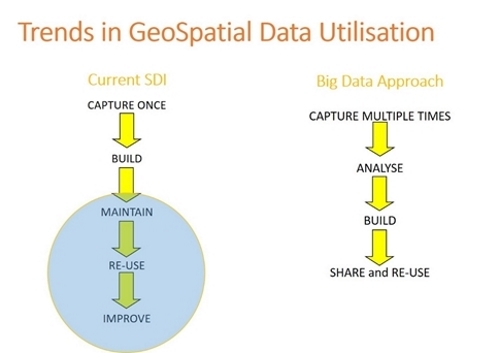 A key issue with respect to SDIs is the maintenance of their spatial data currency. There are thousands of SDIs throughout the world from regional, state and local levels (Budhathoki & Nedovic-Budic 2008). In the meantime, the seven billion humans ‘constantly moving about the planet collectively possess an incredibly rich store of knowledge about the surface of the earth and its properties’ (Goodchild 2007). 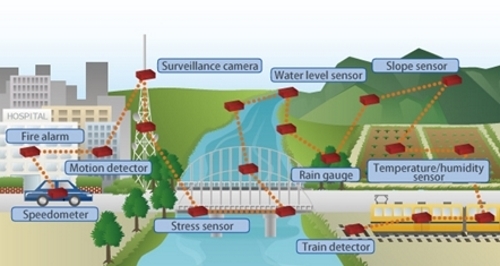 The popularity of using location sensor enabled (GNSS – Global Navigation Satellite Systems) mobile devices along with interactive web services like Google Maps or Open Street Maps (OSM), have created marvellous platforms for citizens to engage in mapping related activities (Elwood 2008). These platforms can support and encourage crowd-sourced geospatial data. The voluntarily engagement of creating geographic information is not new (Goodchild 2007). However, researchers are still struggling to figure out the motivation of volunteers to generate geographic related information. Additionally, sensor-enabled devices ‘can collect data and report phenomena more easily and cheaply than through official sources’ (Diaz et al. 2012). The information infrastructures, via the IoTs, and easily accessible positioning devices (GNSS) has enabled ‘users from many differing and diverse backgrounds’ (McDougall, 2009) to ‘share and learn from their experiences through text (blogs), photos (Flickr, Picasa, Panoramio) and maps (GoogleMaps, GoogleEarth, OSM) not only seeking but also providing information’ (Spinsanti & Ostermann 2010). SDIs are generally considered as more formal infrastructures, being highly institutionalised and having more traditional architectures. In line with the SDI framework, each dataset usually undergoes thorough standardisation procedures and SDI data is generally handled by skilled and qualified people. Therefore, the cost of creation and management is high. SDIs are mainly held by governments and are mostly standards centric as this is important for structuring and communicating data. The standardisation is by means of structure (syntax) as well as meaning (semantic) (Hart & Dolbear 2013). Generally, the crowd-sourced geospatial data comes from citizens and hence the information is often unstructured, improperly documented and loosely coupled with metadata. However, crowd generated geospatial data is more current and diverse in contrast to SDI. Jackson et al. (2010) studied the synergistic use of authoritative government and crowd-sourced data for emergency response. They critically compared the clash of two paradigms of crowd-sourced data and authoritative data as identified in Table 1. ‘Simple’ consumer driven Web services for data collection and processing. 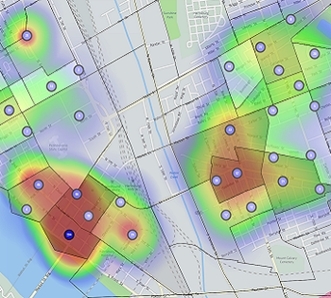 Vs.
‘Complex’ institutional survey and GIS applications. Near ‘real-time’ data collection and continuing data input allowing trend analysis. ‘Historic’ and ‘snap-shot’ map data. Free ‘un-calibrated’ data but often at high resolution and up-to-the minute. Vs. Quality assured ‘expensive’ data. ‘Unstructured’ and mass consumer driven metadata and mashups. Vs. ‘Structured’ and institutional metadata in defined but often rigid ontologies. Unconstrained capture and distribution of spatial data from ‘ubiquitous’ mobile devices with high resolution cameras and positioning capabilities. Vs.
‘Controlled’ licensing, access policies and digital rights. As can be noted in this table the two forms of data may seem as if they are diametrically opposed. Often a major deficiency with authoritative data held in SDIs is their lack of currency which is often the result of the time consuming data collection, checking and management by government agencies. Processes to capture, compile, generate and update authoritative geospatial data have been developed by agencies over long periods of time and were commonly aligned to traditional map production operations. Although technologies have dramatically improved the performance and processes to update many of the data themes, bottlenecks still exist in a number of the processes. These bottlenecks have been further exacerbated through the downsizing of mapping authorities as many of the existing production processes are either no longer required or can be more efficiently undertaken by commercial organisations. The reluctance of mapping agencies to use crowd-sourced data is slowly changing and many organisations are now adapting their processes to use current data user generated data to improve their authoritative data sets. Geospatial data has always been considered to have more complex and larger data sets relative to many other applications. The graphical and visual context of geospatial data, particularly imagery, has to some extent, prepared surveyors and geospatial professionals for the data centric future that now exists. The term “big data” was coined over 20 years ago although it has only developed a much clearer focus in the past decade as a result of technological developments, increased use of sensors and the proliferation of mobile communication technologies. Li et al. (2016) identified that big data can be classified as either unstructured or structured data sets with massive volumes that cannot be easily captured, stored, manipulated, analysed, managed or presented by traditional hardware, software and database technologies. The volume of data is perhaps the most obvious characteristic of big data. Large geospatial data sets that are now commonly acquired and used in the form of remotely sensed imagery, point cloud data, location sensors and social media are creating data in the petabytes. The data sets are not only of a much higher resolution but they are also being captured more regularly by more sensors. This presents not only challenges with storage but challenges with integrating, resourcing and analysing the data. The variety of data is also ever increasing and changing. Data is being captured in traditional vector and raster formats as well as point clouds, text, geo-tagged imagery, building information models (BIM) and sensors of various forms. With the variety of data comes a variety of data formats, some structured and many unstructured, which further complicates the analysis of the data. Many data sets have proprietary formats that do not readily comply with data exchange protocols. The recent data breaches by a number of large corporations has highlighted the need to also remove personal identifiers that are often incorporated within these data sets. 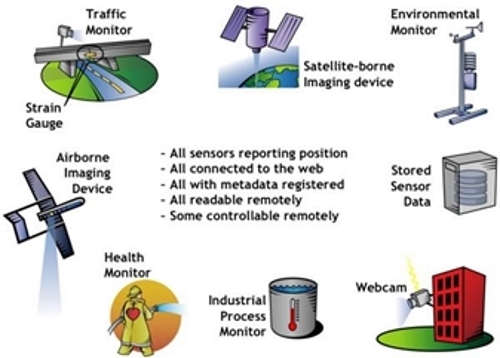 The rate of capture or velocity of data collection is directly related to the number of sensors and their capability to collect data more frequently, the ability to transmit data through wider data bandwidth, and increased levels on connectivity through the internet. User expectations and behaviour are also driving increased demand for real-time data, particularly the social media platforms. The veracity or quality of geospatial data varies dramatically. Many large geospatial data sets acquired from sources such as satellite imagery generally have well known data quality characteristics. However, there are many sources of data where the quality is unknown or where the data provided on quality may not be accurate. This continues to be a major challenge in utilising the emerging data sources with traditional or authoritative data sources. Research continues on approaches and methods to validate the quality of data to ensure it is “fit for purpose”. Geospatial data is multi-dimensional and has traditionally been presented as charts, tables, drawings, maps and imagery. The ability to reorganise data using a geospatial framework provides a powerful tool for decision makers to interpret complex data quickly through visualisation tools such as 3D models, animations and change detection. The improved inter-connectivity of sensors and the repositories where the data is stored has now enabled data to be readily integrated like never before. Personal and closed repositories are now being replaced by cloud storage technology which allows not only secure storage but also the ability to make the data discoverable and visible to other users. Sharing of data with specific individuals or everyone is now possible and easily achieved. Many of the current systems and institutional processes for managing geospatial data were not designed for the current dynamic and demanding information environment. The focus for national and sub-national mapping agencies has been to provide reliable and trusted data for their primary business or to meet legislative requirements. These environments are generally restrictive in their data sharing arrangements and most data is held within institutional repositories within government agencies, which often brings a high degree of institutional inertia. Due to the time and costs to implement new data models and strategies, these organisations are also often slow to respond to new information management approaches and conservative in their data sharing due to government restrictions and legislation. The development of spatial data infrastructures has followed the approach of capturing the data once and then using the data many times. The continual improvement in spatial data infrastructures has relied on the fact that many of the authoritative data sets will remain largely stable in their format, structures and business needs. This has enabled these data sets to be continually maintained and improved using traditional approaches but may not encourage innovation or change. The improvement in the communication technologies and data infrastructure has been a fundamental driver for increased growth and utilisation. High quality broadband infrastructure and high speed mobile phone and data technologies has enabled developing, emerging and developed societies to rapidly utilise the new mobile technologies. 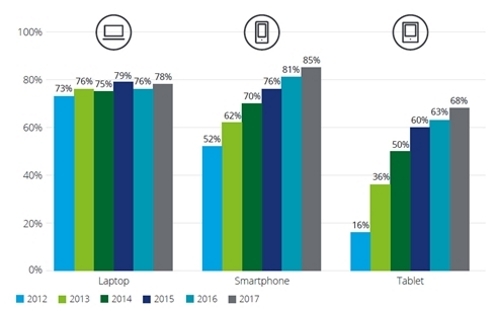 Smartphones and tablets are now the technology of choice for accessing and communicating data for the majority of users. Just as the growth in laptop devices recently overtook the growth in desktop computers, smartphone utilisation by adults in the UK has now overtaken the utilisation of laptops (Figure 7). This trend continues to support the preference for mobile technology, not just with teenagers but also by adults. Smartphones and tablet technologies now provide the benefit of mobility with the data capabilities of many laptops and desktops through the mobile applications and tools for both business and private usage. The dramatic impact that has been made on society by the mobile phone technology and data communication has been supported by the development of mobile software applications. These applications range from simple web search tools and utilities, to complex business tools and social media. Social media applications such as Twitter, Facebook and Instagram now have billions of users and followers generating massive volumes of data including text messages, images and videos. The connectivity to other data sources via the internet has created an incredible network of data linkages and forms the foundation of the business model for these platforms to monetise their user interactions. An enormous amount of data is now created and utilised, not only by commercial organisations and governments, but also by the billions of individual users on ICT technologies. In recent times, there has been an increased interest in the use of big data and crowd-sourced data (CSD) for both research and commercial applications. Volunteered Geographic Information (VGI) (Goodchild 2007), with its geographic context, can be considered a subset of Crowd-sourced Data (CSD) (Goodchild & Glennon 2010; Heipke 2010; Howe 2006; Koswatte et al. 2016). VGI production and use have also become simpler than ever before with technological developments in mobile communication, positioning technologies, smart phone applications and other infrastructure developments which support easy to use mobile applications. However, data quality issues such as credibility, relevance, reliability, data structures, incomplete location information, missing metadata and validity continue to be one of big data’s major challenges and can limit its usage and potential benefits (De Longueville et al. 2010; Flanagin & Metzger 2008; Koswatte et al. 2016). Research in extracting useful geospatial information from large social media data sets to support disaster management (de Albuquerque et al. 2015; Koswatte et al. 2015) and the update of authoritative sets from other non-authoritative data such as Open Street Maps (Zhang et al. 2018) has identified the potential of data geospatial data analytics. Data analytics and machine learning are already widely utilised in the analysis of large volumes of data collected by the search engine and social media companies. Similarly, opportunities exist within areas of big geospatial data where improvements in the quality and currency of existing authoritative data sets could be achieved. Although authoritative geospatial data is generally of a very high quality, errors in quality geospatial data sets are not uncommon. For example, in the early data versions of Google Maps, much of the data was originally acquired from authoritative geospatial sources. 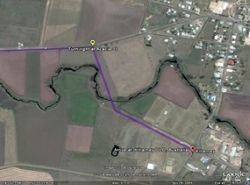 However, the data was not originally designed for navigational purposes and therefore some roads that existed as roads in a database were not yet built and hence could not be used for navigation. 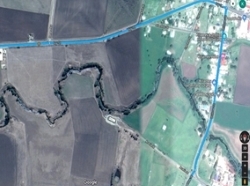 As figure 8 (a) illustrates, the 2009 version of Google Maps of an area in Queensland, Australia, provided incorrect navigation data that would have directed the driver through a farm and into a river. However, nine years later, and with improved data provided through geospatial data analytics, the correct navigational route has been identified (figure 8b). One of the major challenges for mapping agencies is to identify changes in their data themes when new development or changes occur, for example if a new property is constructed or changes to a building footprint is undertaken. In these instances, it would be beneficial to periodically analyse high resolution satellite imagery to identify these temporal changes to alert the data editors that potential changes have occurred. Geospatial data analytics of big data can facilitate this change detection through temporal analysis of high resolution imagery at regular intervals. Artificial intelligence (AI) can encompass a range of approaches that can lead to the automated analysis of large data sets. Rules based approaches provide a framework for analysing data based on defined requirements or rules. These approaches may be suitable for analysing geospatial data held in regulatory environments where certain conditions are required for compliance. For example, minimum distance clearances or offsets from the boundaries of a property may be required under planning regulations. On the other hand, machine learning analyses data to identify patterns, learns from these patterns and then can self-improve once the system is trained. It is used widely in analysing patterns of internet searching and social media which can help predict the needs and preferences of users in order to better customise searches and also market products. A hybrid approach that draws on a combination of machine learning and existing rule sets, such as geographic placename gazetteers, may provide a suitable platform for improving geospatial databases. Importantly, to integrate disparate data sets and models, special domain terminology and language needs to be established through the development of geospatial semantics and ontologies. Finally, the improvements in the locational accuracy of mobile sensors, particularly smartphones, will provide opportunities to improve the quality of a range of geospatial data sets. The recent release of a dual frequency GNSS chipset for smartphones now provides the opportunity to capture improved 2D and 3D positional data. Potential applications may include the collection of positional data for transport or infrastructure that may improve the locational accuracy of low spatial quality data sets. The improved 3D accuracy of the spatial location of devices may provide better information to support emergency services in cases of search and rescue. We are now living in a highly data driven and data centric society where the expectations of the data users are ever increasing. The geospatial industry has continued to lead in the development of innovative solutions that provide improved outcomes for citizens and communities. The big data environment presents a range of challenges for the custodians of authoritative geospatial data sets and opportunities for industries that are seeking to embrace the new big data opportunities. Bakri, A & Fairbairn, D 2011, 'User Generated Content and Formal Data Sources for Integrating Geospatial Data', in Proceedings of the 25th International Cartographic Conference: proceedings of theProceedings of the 25th International Cartographic Conference, A Ruas (ed. ), Paris, France. Bishr, M & Kuhn, W 2007, 'Geospatial information bottom-up: A matter of trust and semantics', in S Fabrikant & M Wachowicz (eds), The European information society: Leading the way with geo-information, Springer, Berlin, pp. 365-87. Budhathoki, NR & Nedovic-Budic, Z 2008, 'Reconceptualizing the role of the user of spatial data infrastructure', GeoJournal, vol. 72, no. 3-4, pp. 149-60.
de Albuquerque, JP, Herfort, B, Brenning, A & Zipf, A 2015, 'A geographic approach for combining social media and authoritative data towards identifying useful information for disaster management', International Journal of Geographical Information Science, vol. 29, no. 4, pp. 667-89. De Longueville, B, Ostlander, N & Keskitalo, C 2010, 'Addressing vagueness in Volunteered Geographic Information (VGI)–A case study', International Journal of Spatial Data Infrastructures Research, vol. 5, pp. 1725-0463. Diaz, L, Remke, A, Kauppinien, T, Degbelo, A, Foerster, T, Stasch, C, Rieke, M, Baranski, B, Broring, A & Wytzisk, A 2012, 'Future SDI – Impulses from Geoinformatics Research and IT Trends', International Journal of Spatial Data Infrastructures Research, vol. 07, pp. 378-410. Elwood, S 2008, 'Volunteered geographic information: future research directions motivated by critical, participatory, and feminist GIS', GeoJournal, vol. 72, no. 3-4, pp. 173-83. Evans, MR, Oliver, D, Zhou, X & Shekhar, S 2014, 'Spatial Big Data: Case Studies on Volume, Velocity, and Variety', in HA Karimi (ed. ), Big Data: Techniques and Tecnologies in Geoinformatics, CRC Press, pp. 149-76. Flanagin, AJ & Metzger, MJ 2008, 'The credibility of volunteered geographic information', GeoJournal, vol. 72, no. 3-4, pp. 137-48. Goodchild, MF 2007, 'Citizens as sensors: the world of volunteered geography', GeoJournal, vol. 69, no. 4, pp. 211-21. Goodchild, MF & Glennon, JA 2010, 'Crowdsourcing geographic information for disaster response: a research frontier', International Journal of Digital Earth, vol. 3, no. 3, pp. 231-41. Harris, TM & Lafone, HF 2012, 'Toward an informal Spatial Data Infrastructure: Voluntary Geographic Information, Neogeography, and the role of citizen sensors', in K Cerbova & O Cerba (eds), SDI, Communities and Social Media, Czech Centre for Science and Society, Prague, Czech Republic, pp. 8-21. Hart, G & Dolbear, C 2013, Linked Data: A Geographic Perspective, CRC Press, NW, USA. Heipke, C 2010, 'Crowdsourcing geospatial data', ISPRS Journal of Photogrammetry and Remote Sensing, vol. 65, no. 6, pp. 550-7. Howe, J 2006, 'The rise of crowdsourcing', Wired magazine, vol. 14, no. 6, June 2006, pp. 1-4. Jackson, M, Rahemtulla, H & Morley, J 2010, 'The synergistic use of authenticated and crowd-sourced data for emergency response', in Proceedings of the 2nd International Workshop on Validation of Geo-Information Products for Crisis Management (VAL-gEO): proceedings of theProceedings of the 2nd International Workshop on Validation of Geo-Information Products for Crisis Management (VAL-gEO) Ispra, Italy. Koswatte, S, McDougall, K & Liu, X 2015, 'SDI and crowdsourced spatial information management automation for disaster management', Survey Review, vol. 47, no. 344, pp. 307-15. Koswatte, S, McDougall, K & Liu, X 2016, 'Semantic Location Extraction from Crowdsourced Data', ISPRS-International Archives of the Photogrammetry, Remote Sensing and Spatial Information Sciences, pp. 543-7. Li, S, Dragicevic, S, Castro, F, Sester, M, Winter, S, Coltekin, A, Pettit, C, Jiang, B, Haworth, J, Stein, A & Cheng, T 2016, 'Geospatial big data handling theory and methods: A review and research challenges', ISPRS Journal of Photogrammetry and Remote Sensing, vol. 115, pp. 119-33. McDougall, K 2006, 'A Local-State Government Spatial Data Sharing Partnership Model to Facilitate SDI Development', The University of Melbourne, Melbourne. Spinsanti, L & Ostermann, F 2010, 'Validation and relevance assessment of volunteered geographic information in the case of forest fires', in Proceedings of Validation of geo-information products for crisis management workshop (ValGeo 2010): proceedings of theProceedings of Validation of geo-information products for crisis management workshop (ValGeo 2010) JRC Ispra. Zhang, X, Yin, W, Yang, M, Ai, T & Stoter, J 2018, 'Updating authoritative spatial data from timely sources: A multiple representation approach', International Journal of Applied Earth Observation and Geoinformation, vol. 72, pp. 42-56. Professor Kevin McDougall is currently the Head of the School of Civil Engineering and Surveying at the University of Southern Queensland (USQ). He holds a Bachelor of Surveying (First Class Honours) and Master of Surveying and Mapping Science from the University of Queensland, and a PhD from the University of Melbourne. Prior to his current position Kevin has held appointments as Deputy Dean, Associate Dean (Academic) and the Head of Department of Surveying and Spatial Science at USQ. He has served on a range of industry bodies and positions including the Queensland Board of Surveyors, President of the Australasian Spatial Information Education and Research Association (ASIERA) from 2002-2008 and the Board of Trustees for the Queensland Surveying Education Foundation. Kevin is a Fellow of Spatial Sciences Institute and a Member of The Institution of Surveyors Australia.